Everyday in Israel we saw fairly incredible places and most, if not all, related to the Bible in one way or another. But narrowing that list down to 20 sites that really grabbed my attention may be hard and I have to say before I even start that prioritizing the list will likely prove impossible so I won’t even bother. I mean what would make it the top place? What happened there, how moved I was by the location, how much work it took to get there,the importance it played in my development of faith or simply whether a much needed cool breeze blew there? There were so many times where I was reminded of days spent in Sunday school, vacation Bible school or church camp…. and passages from the Bible and songs about the stories from these places ran through my head like an unwitting soundtrack. One thing I feel I should explain up front, if something of Biblical importance happened somewhere…. a church has been built there it seems. The churches ranged from those of great splendor to those of simplistic beauty. All provided quiet time for reflection with many having beautiful gardens to enjoy as well. It is a challenging thought to narrow it down to some of the religious sites that would be at the top of the list. But I am going to try and give it my best shot. The Dead Sea is the lowest spot on the surface of the globe and you drive into the West Bank to reach it. The drive in was sobering as the territory remains disputed & well guarded. But once we got to the sea, that seemed to melt away as we floated in the incredibly mineral rich waters! We all tried the mudpack too! While I didn’t walk on water, the fact that the water makes you so incredibly bouyant makes you think it could be possible! 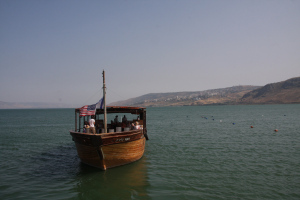 The Sea of Galilee we stopped at several places along the sea, but taking a boat ride across it was really wonderful. We had some great music, dancing and fishing to boot. What more could you ask for? Mount Tabor where according to tradition the miracle of the Transfiguration of Christ took place. This church, built on top of the hill, gave us a lot of pause for thought as well as a bit of respite from the hotter temps well below us. 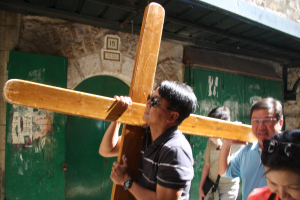 Jerusalem’s Via Dolorosa begins just after the walls of the old city near the arch of Ecce Homo in the Muslim Quarter and ends at the Church of Holy Sepulcher in the Christian Quarter. Our group took turns carrying the cross and reading. The walk up was moving and pausing at each station to understand what had happened there…. wow. The church (also known as the Church of the Resurrection) was a lot to take in. There are multiple chapels with several Christian groups. We saw the various ways the groups worshipped and to see so many different types of priests in one place was impressive too. 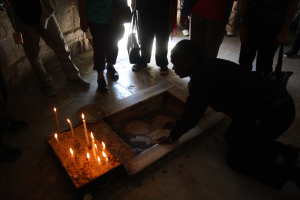 We all waited patiently in line to go into the tiny tomb where Jesus is said to lay… wow. Bethlehem’s Basilica of the Nativity is one of the earliest and most important of all Christian buildings. 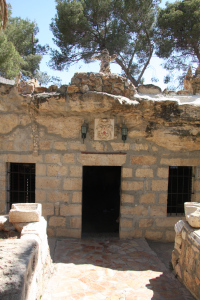 This Basilica enshrines the cave believed to be the place where Jesus was born. Several religious orders have churches here including the Russian orthodox. We held a mass in St. Catherine. It is in this church that Christmas midnight mass is celebrated and relayed throughout the world via satellite. Haifa’s Mount Carmel includes Carmelite Monastery, Chapel of the Holy Family and Elijah’s Cave were in one location that has been identified as a place where the Holy Family rested on its way back from Egypt. Its also where Elijah hid. Bethlehem’s Shepard’s Field Church built where angels appeared to the shepherds announcing the birth of Jesus. It was one of the nicest places to me because the simplicity of the grounds let me imagine how it was centuries ago. Church of the Milk Grotto is another church in Bethlehem and is a place where people come to pray to Mary for healing. Jaffa’s St. Peter’s Church was built alongside the house of high priest Caiphas and is the site where Peter denied Jesus. Tabgha’s Church of the Multiplication and St Peter’s Primacy — its quite close to the Sea of Galilee. Sounds like so many fish fries I’ve been to someone was supposed to catch fish for all of us but it took a grocery store to get us enough food for the crowd. The Hometown of John the Baptist was Ein Karem and we saw a number of places there including a beautifully cool spring. Hagia Maria Sion Abbey on Mt. 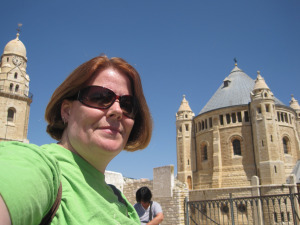 Zion (formerly known as the Dormition Abbey) was consecrated in 1910 and is the location where Mary rests. Mount of Olives which provides a great overlook of Jerusalem’s old city. We went to the Church of the Ascension (it is from here that Jesus is believed to have risen) then the Church of Pater Noster where the Lord’s Prayer was delivered & is now seen in numerous translations. In the midst of a desert we saw a very rare site, a centuries old sycamore tree in Jericho that tradition says was where Zacchias climbed to get a view of Jesus as he came through town. Nazareth’s Basilica of the Annunciation enshrines the grotto where, according to tradition, the angel Gabriel appeared to the Virgin Mary and told her that she would have a son. Cana, scene of the first miracle of Jesus, where he turned water into wine and the church where friends renewed their vows. The Upper Room (on Mount Zion) commemorates the place where Jesus celebrated the Last Supper with his disciples. It is also associated with an earlier, at least 4th-century tradition that this was the place where the disciples gathered with the Virgin Mary and others of the community after the death of Jesus – and where they experienced the descent of the Holy Spirit at Pentecost. The Mount of the Beatitudes where Jesus preached the Sermon on the Mount (blessed are the meek, the merciful, the pure of heart, and the peacemakers). The Wailing Wall or Western Wall is a remnant of the great retaining wall around the Temple Mount platform, which has been a place of Jewish prayer and devotion since the destruction of the Second Temple by the Romans in 70 CE. The area has close security to enable people of all faiths to gather & leave prayers on the wall. AMAZING! Thanks for sharing this JP! Wow, this sounds and looks like an incredible vacation! It really was! I can’t believe how lucky I am to have had these experiences! JP, Just catching up on your blog and absolutely love this slide show along with your thoughts about the trip. I cannot imagine the feelings of awe that you must have experienced! You are certainly the world traveler….where is your next big trip??? I just sat down with lunch and started going through your posts that I have been wanting to read but did not have ample time. I am so grateful that you took the time to write about your trip, share the photographs and your thoughts. All of it is amazing and so wonderful to read. I can’t imagine being in those places, it had to be wonderful! Thanks girl! I certainly enjoyed the trip and it’s been nice to go through some of it after the fact too! Helps me seal the details in my mind! My coworker took a similar trip to Israel earlier this year. Seeing his pictures and now your pictures makes me even more interested to go. I always think it would be interesting to see places mentioned in the Bible, and it would probably help give an even better understanding to what we are reading. I didn’t read through the comments so it may have already been mentioned but the Church of St. Peter in Gallicantu near the house of high priest is not in Jaffa. It is located on Mt. Zion in Jerusalem.